It’s a bit of a no-brainer really… Keep Left Unless Overtaking – and NO that doesn’t mean you can speed to overtake! a speed limit of more than 80km/h (e.g. 90km/h, 100km/h). a keep left unless overtaking sign. no marked lanes – so that you’re on the left of any incoming vehicle. only one lane going one way – so that you’re on the left of the dividing line. a median strip in the middle of the road. two or more lanes going the same way. overtaking a vehicle in the left lane – NO you can’t speed to overtake. driving and traffic in the left lane is congested – NO a couple of cars does not mean congested. driving and the left lane is a ‘slow vehicle turnout’ lane – BUT, if you are driving slow in the right lane and there is a car behind you should be courteous and move into the left ‘Slow vehicle turnout lane’. turning right – and you have your indicator on and it is safe to. doing a u-turn – and you have your indicator on and it is safe to. approaching a left lane must turn left sign and you’re not turning left. avoiding a hazard on the road – and it is safe to. avoiding a bike on the road – and it is safe to. 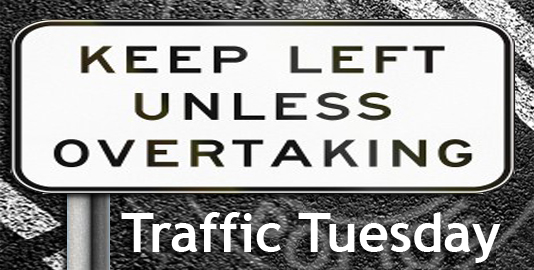 This page -- https://www.police.tas.gov.au/what-we-do/traffic-policing/traffic-tuesday/6-keep-left-unless-overtaking/ -- was last published on October 11, 2017 by the Department of Police, Fire and Emergency Management.